Wicket-keeper Adam Rossington could return from injury in time to face Lancashire Lightning in the NatWest T20 Blast at the County Ground on Friday night (start 6.30pm). Rossington has been named in the Steelbacks’ 12-man squad, but there is a chance the 22-year-old may have to wait an extra day as Northants refuse to take any risks with his fitness ahead of the start of the County Championship Division Two clash with Kent on Saturday. Rossington has not played since suffering a quad muscle injury in the Championship defeat at Glamorgan earlier this month. 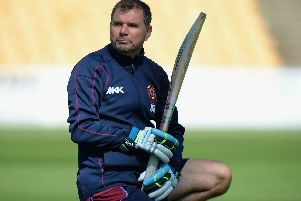 And Northants head coach David Ripley said: “It’s possible that he’ll be ready for Friday. “I’m pretty confident he’ll be ready for Saturday, it’s just whether we risk him for the Lancashire game. “We need to be 100 per cent confident he’s ready to play on Friday because of the four-day game starting a day later. However, Stephen Peters will definitely still be sidelined with a broken thumb and David Willey is with England as he continues to perform in their ODI series against New Zealand, with the final match of a thrilling five-day series being played at Durham on Saturday. Nevertheless, Ripley is looking forward to another busy spell, with Friday’s clash with Lancashire an important one as Northants look to make it four games unbeaten in the 20-over format. “Lancashire have got a bit of pedigree,” said Ripley. “They were in the final last year and they’ve got some dangerous players. “We’re both missing one of our main players because we’re without David Willey and they haven’t got Jos Buttler. That evens itself out. “We’re confident because we play well at home and we’re eager to get going. “We played particularly well at Yorkshire last Sunday against a team full of world-class players.